Sprint users of the Galaxy S10 handsets have had a share of issues since the devices started selling on the carrier last month. In addition to the common fingerprint scanner issues, S10 units using Sprint have had difficulties with LTE connectivity, but the carrier says this has been fixed via the latest software update. 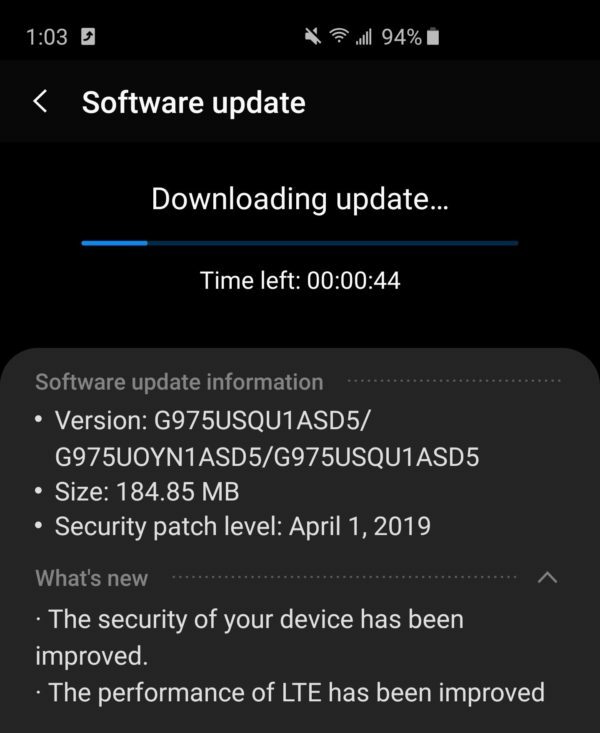 A good number of Galaxy S10+ users on Reddit are reporting to have received an update that carries software version G975USQU1ASD5. The update weighs about 185MB and besides installing the latest April 2019 security patch, it also improves LTE performance on the device. This should come as good news for not just users of the Galaxy S10+ on Sprint, but also others using affected Galaxy S10 and S10e models. This is because we also expect the same ASD5 update to arrive on the standard S10 and the smaller S10e too. Affected Galaxy S8 and Note 8 users should also get their treat pretty soon. Some of those who have already installed the update also say they’ve noticed improvements in the performance of the in-display fingerprint scanner, another feature that has been quite wanting since launch. Sprint has been quite good with timely software updates for Samsung flagships, but being good to a point of beating the global variants in rolling out the latest S10 updates is quite new around here. Hopefully, we’ll keep seeing more of this energy.